A cream coloured textile tablecloth. It has many smaller flowers embroidered all over the tablecloth. 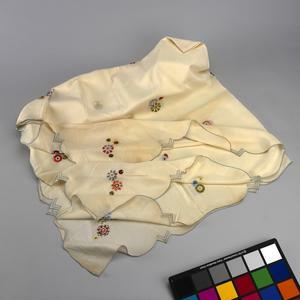 An embroidered tablecloth being an example of the type of item brought to Britain and the USA by German and Austrian emigrants between 1933 - 1939. This cloth belonged to a relative of the donor's husband who emigrated to the USA.